Nestled in the heart of southern New Hampshire’s rolling hills and country landscape, Londonderry Country Club is a public 18 hole, executive course that offers a complete golfing experience with numerous challenging par 4 and par 3 holes. Established in 1969, the course was originally built as a 9 hole, par 27, and developed over the next twenty two years into a 3,840 yard, par 62 layout filled with velvet bentgrass greens and tree-lined bluegrass fairways. Big enough to challenge any golfer’s skill level, Londonderry Country Club can be played, walking, in three and a half hours – a valuable attribute in today’s time-pressed world. The picturesque grounds were first operated by Forest Kimball, and the establishment still resides in the Kimball family, now in its eighth generation. The current owners of New Hampshire’s premier executive golf course, Tom and Helga Kimball, strive to provide you with a memorable and enriching experience during your visit. Their decision to recently commission golf course architect, George F. Sargent, in order to redesign Holes 7, 8 and 9, symbolizes their commitment to making your visit unique and challenging. Aside from offering an outstanding round of golf, Londonderry Country Club also provides a scenic and relaxing atmosphere for anyone looking to unwind with family and friends after a day on the links or to celebrate a special occasion. Complete with a Pro Shop, Snack Bar, Nutfield Lounge and Banquet Facility that overlook the course and a practice green, the clubhouse possesses every type of setting to accommodate your next outing or function. We look forward to seeing you soon at the Londonderry Country Club! The mission of the Londonderry Country Club is to provide affordable golf to all levels of players in an esthetically pleasing and friendly atmosphere. We welcome you to enjoy the beauty of one of the state’s finest courses, boasting all the true symbols of a New England heritage. 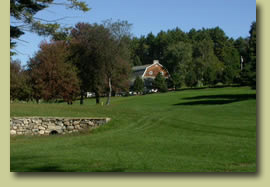 We believe in upholding the stewardship of the golf course and its facilities in an environmentally conscientious manner, so we encourage you to take notice of New Hampshire’s treasures, including the colorful, deciduous trees and native wildlife, that can be found on the course’s perimeter. We look forward to hopefully seeing you soon, and providing you personalized service tailored to meet your needs.